You can be the best professional electrician in the business, but if you don’t have a marketing strategy how will anyone know? 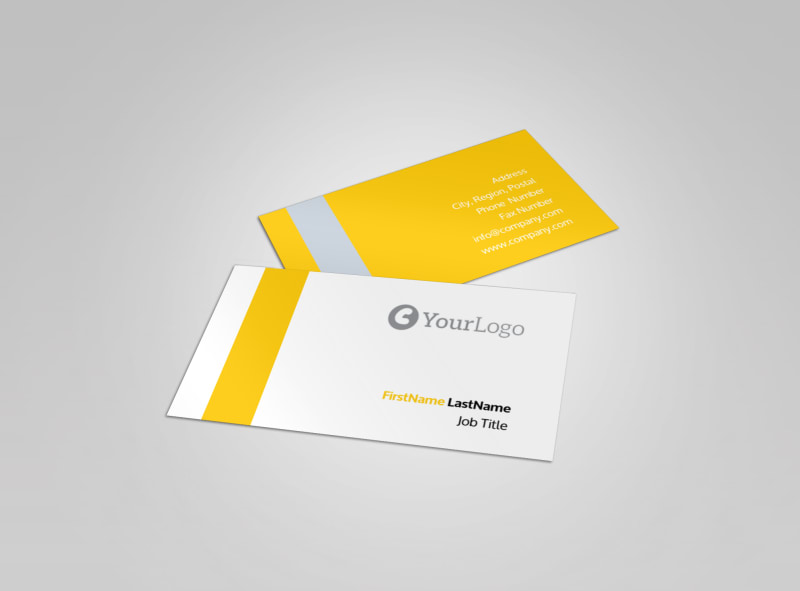 Begin with well-designed business card to promote your brand and set yourself apart from competition. 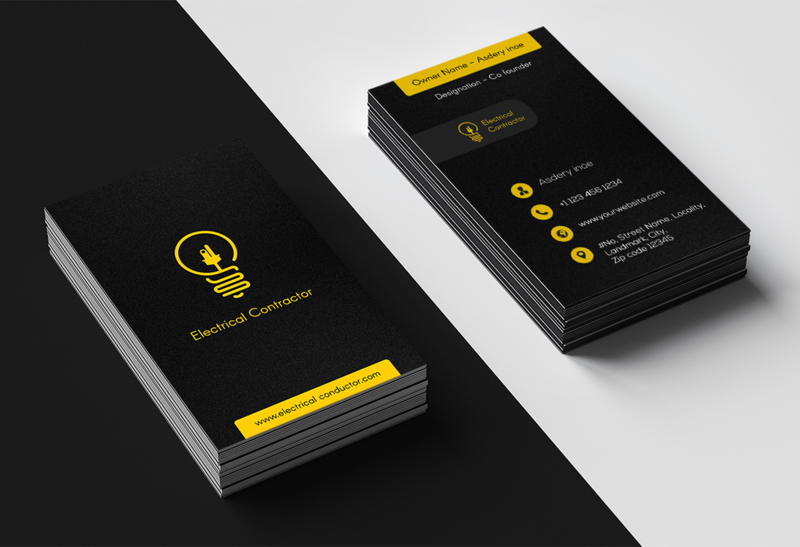 Here are the top 25 electrician business cards from around the web to inspire your design. One of the simplest but most iconic symbols for electricity is the light switch. And in order for this simple design to impress clients, it needs to look striking even as a plain white image on the card. Choose a realistic image with the right lighting and size. Once you have your design, make sure your business cards come out sharp and clear by having them professionally printed with Vistaprint. Vistaprint is the business card provider of choice for small businesses with its affordable price and great turnaround time. 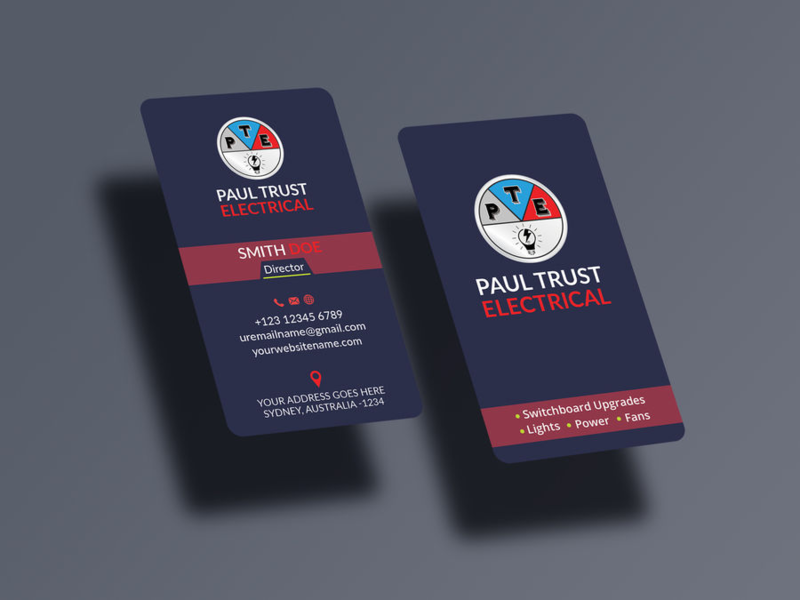 And if you still haven’t finalized your business card design, you can easily choose from their over 10,000 templates or get help from one of their professional designers. If you feel like using a more elegant look, you can use an electric circuit to design your background. Pair it with a typeface that matches your theme, with colors and layout to make it more eye-catching. Remember to make sure your text is always readable against the background. A fresh take on the use of electrical circuits from our previous example. The yellow and gray theme turns the circuit icon into a striking design feature that will surely attract potential clients. The overall design gives an interesting and modern brand to your business. 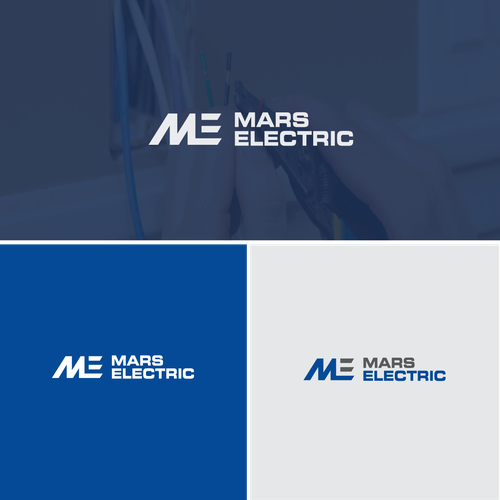 For this example, two design elements stand out: the free-flowing electric current and the use of blue as its overall color theme. In color psychology, this color evokes calmness or serenity, and using it on a professional business card helps promote a sense of reliability and professionalism to your brand. Even a simple logo can become eye-catching with the right design. Chose colors and shapes that will help your brand stand out and impress your clients. In this example, a square business card is combined with block colors and a bright orange icon to come up with a simple look that showcases your logo to build your brand. Stand out from your competition with PsPrint and create premium business cards at discounted prices. This example is all about the use of intensity to attract and leave a lasting impression on your potential clients. The red background and the use of spot UV on the live electricity image give this design the ability to evoke a strong emotion from your audience. Take advantage of this by adding a short call to action on your card. 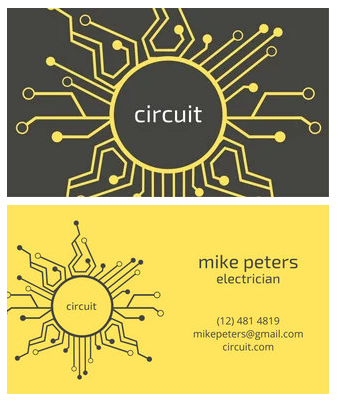 Here’s an electrician business card for those looking for a vintage feel. The background color and design resemble recycled paper stock while the image reminds you of an old-school illustration. It also doubles as an appointment card so you’re sure that clients will hold on to it for their future needs. 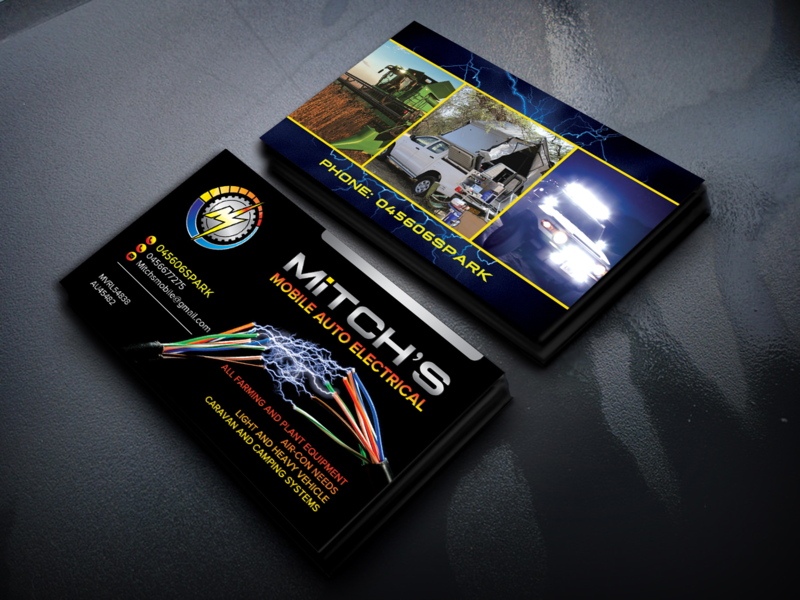 Automobiles need electrical care too, and this example business card is specifically for clients looking for auto electricians. 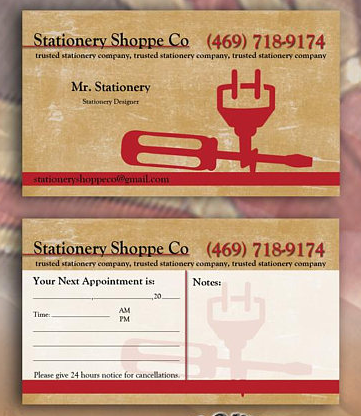 Notice how elements of the business logo are incorporated in the design, from the color scheme to the images added to the card. It also shows a list of expertise that’s supported by images at the back of the card. 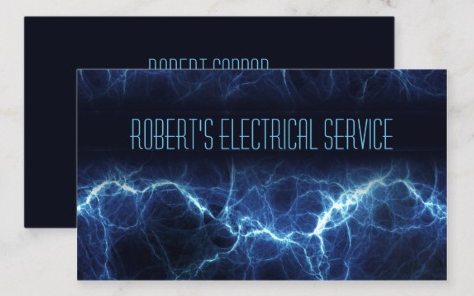 This is a very modern electrician business card design. The chrome and orange color scheme is adapted from the business logo and set in a plain black background for a striking visual presentation. 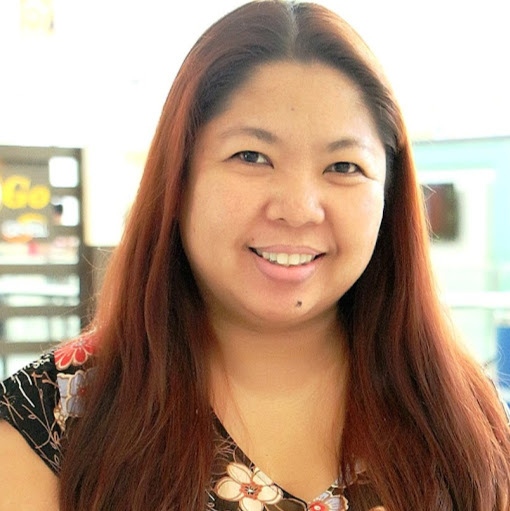 It also helps to make sure that the text is clear and can be easily read. Using frosted plastic for your business card instantly gives you more design options, such as adding purpose like a small measuring device. It also ensures that your business card is more durable compared to paper stock versions. The texture is also an added feature that encourages the audience to engage more. 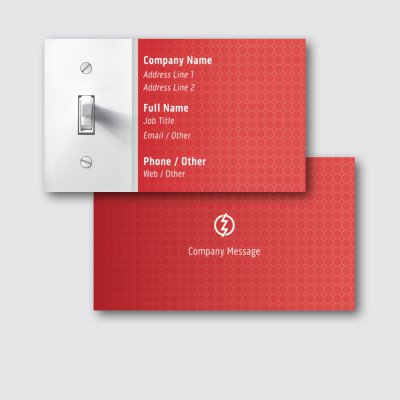 This is an eco-friendly business card for electricians keen on adding this feature to their brand. Green is used to add design accents to reinforce the concept of green energy. The combination of the chosen typeface (that makes use of clean square lines) and the centered layout all emphasize the idea of balance. 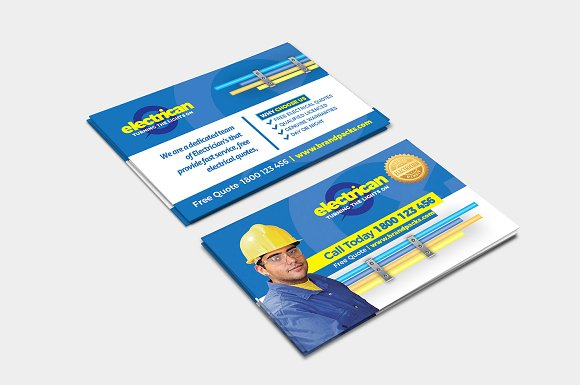 A bright yellow business card for electricians can be effective with the right design. 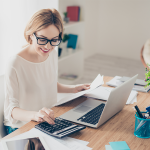 In color psychology, yellow evokes cheerfulness and warmth, so if your brand is all about being friendly, approachable, and professional, this color is right for you. Add your logo and an image that lets your business stand out and become memorable to potential clients. A corporate design immediately gives potential clients a professional impression of your brand. The combination of blue and yellow is very typical, but don’t hesitate to replace this with your own brand colors. 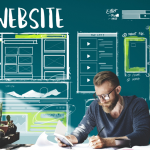 We like how the design includes effective marketing features, including a seal of excellence—a smart way to showcase achievements to boost customer trust. We mentioned in previous examples how the color blue helps in business branding. Blue is the go-to color of businesses that would like to project an image of dependability, productivity, and trust. It’s also non-invasive, which means it will never overwhelm or cause strain on your audience’s eyes. Set yourself apart by knowing the right accent colors or choosing the right shade of blue to show your personality. 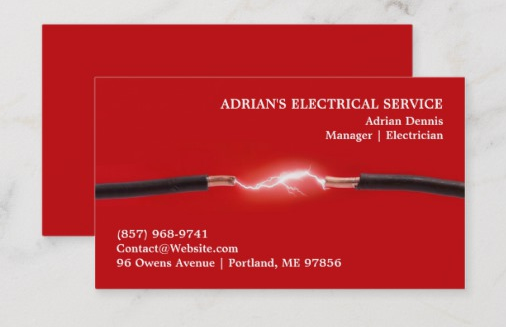 This is a very simple, red and white business card design for those who are looking for a clean, straightforward look. Using bright red for the font color gives the right amount of personality that also matches the logo. Notice how the font size is used to emphasize important information on the card. Do you specialize in a particular field? The microchip design for this example shows how professional electricians can immediately give customers an idea of what they do best. This one can be for an electrician who’s great with fixing machines and other device used at home or at work. Notice also the use of a QR code to help potential clients connect with you through their mobile. 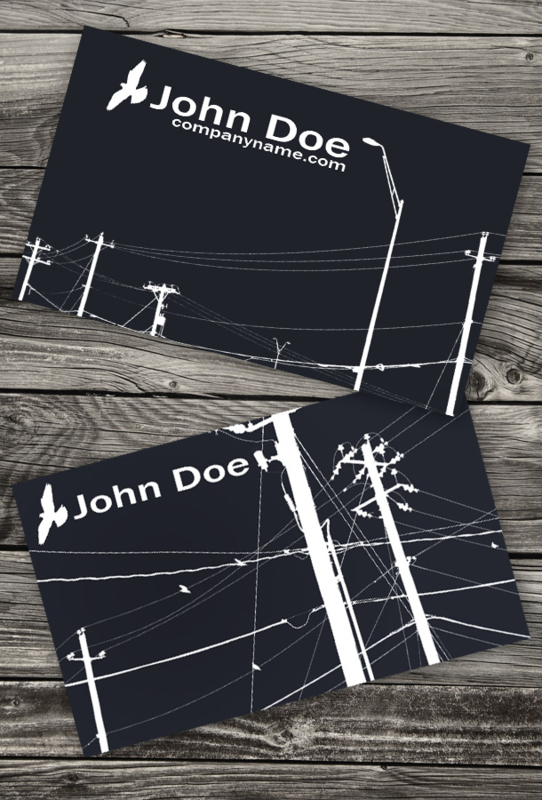 This grunge design gives your business card a very industrial look. The use of black and chrome with the bold typeface adds to the overall vibe. 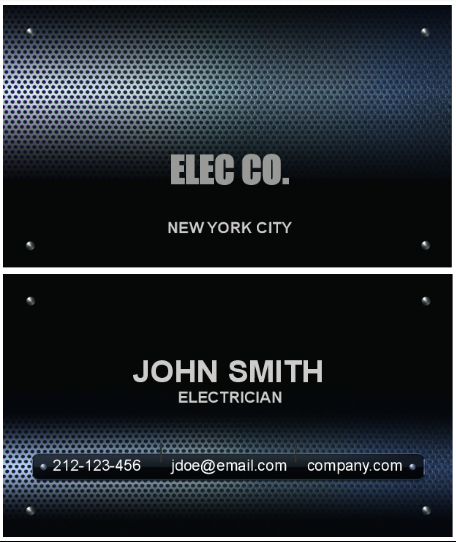 Add visual accents to make this electrician business card more specific if you want to emphasize a specialization. This example makes use of a grid background to simulate an electric grid look. 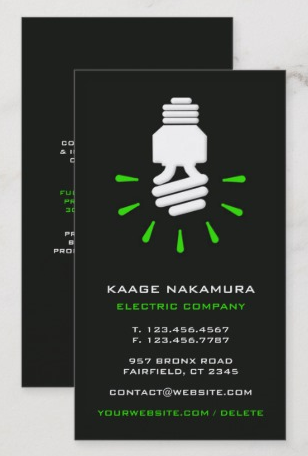 The large, partial light bulb icon on the upper right-hand corner adds an interesting design element to your business card. Notice also how a call to action stands out by using a different color for the text. We love the die-cut corners of this vertical business card, as the shape easily makes it stand out. It’s also important to note how colors were used to highlight important features on the card. 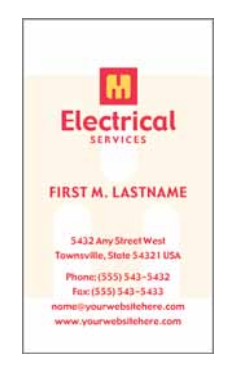 Notice how the word “electrical” and the business card owner’s last name is in red, making it easy to recall. The icons for the contact details are also in red to signify the importance of the information to its audience. 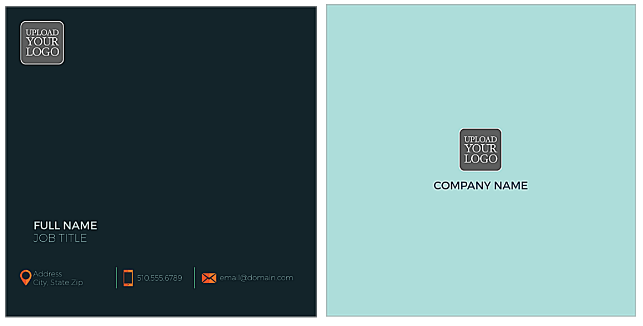 If you decide to use a multicolored logo or business name design, go for a business card look that lets it stand out. 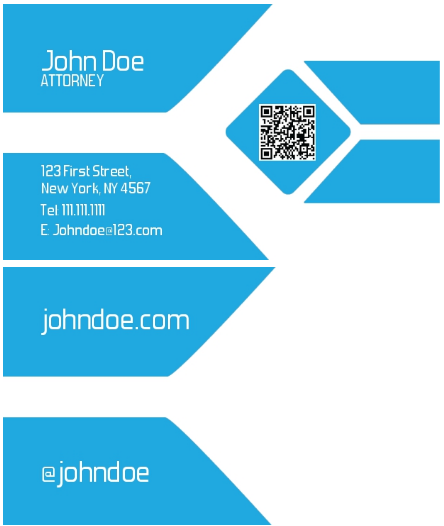 The idea is to use this design element only once to keep your business card clean and pleasant to look at. A black background can do the job nicely. You can even add a three-dimensional or blending effect, as in our example, for more personality in your design. 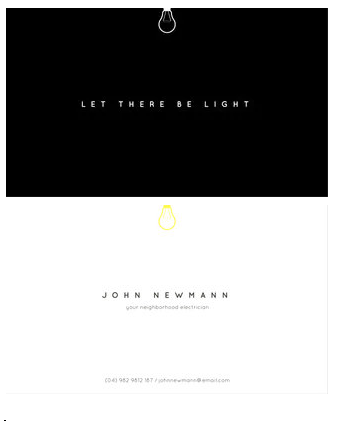 Yellow on black always leaves a striking look and is very impressive when used on business card designs. We love how yellow is used on this example for the icons and for the small frames at the top and bottom to highlight the company name and website. The very creative logo of a light bulb made of an electrical cord also works well with the semi-minimalist approach of this design. This one takes advantage of recognizable symbols and colors to become a memorable brand. 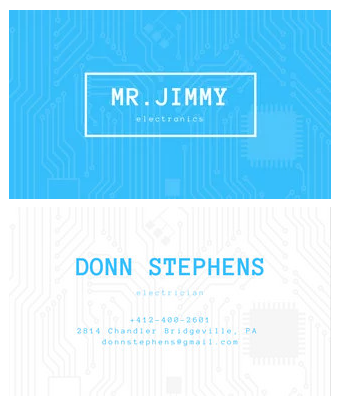 First, note how the business name is “Higher Power” to understand the idea to the overall business card design. 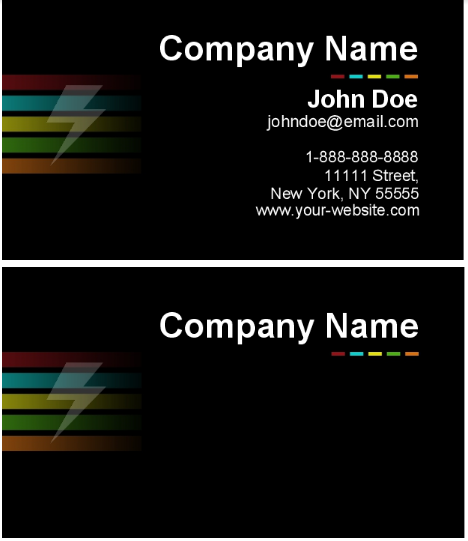 The dominant color on one side of the card is yellow, with a pair of black irregular shapes for a smart recreation of a lightning bolt. 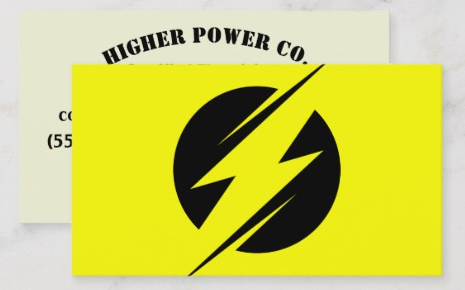 Both the color and logo are synonymous to the popular high voltage warning signs that everyone can recognize. 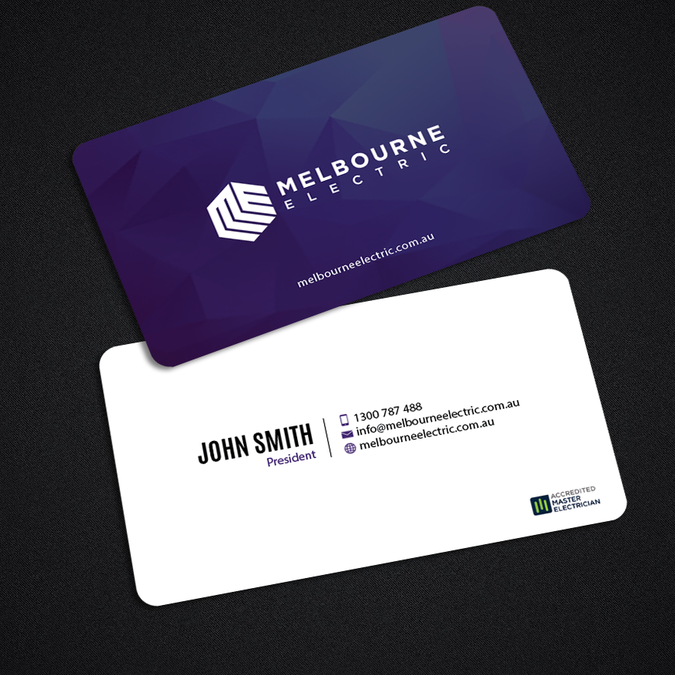 You don’t have to pay extra for a special finish to give your business card a unique look. This design includes a three-dimensional background by adding lines, shadows, and highlights to a plain-colored background. Try doing this on your own by experimenting with effects on your editing tool or have a professional do it for you. 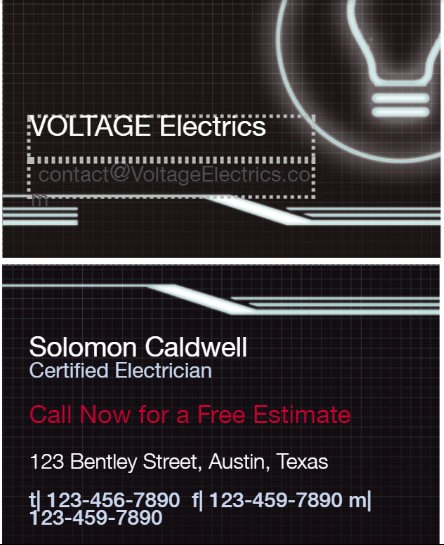 If you thought a black minimalist design can’t work for a professional electrician business card, think again. Note how this example manages to create a memorable impression using just an illustrated light bulb icon and a simple quote. This adds an elegant and modern personality to your brand. A reliable infrastructure can’t be complete without the help of electricians. 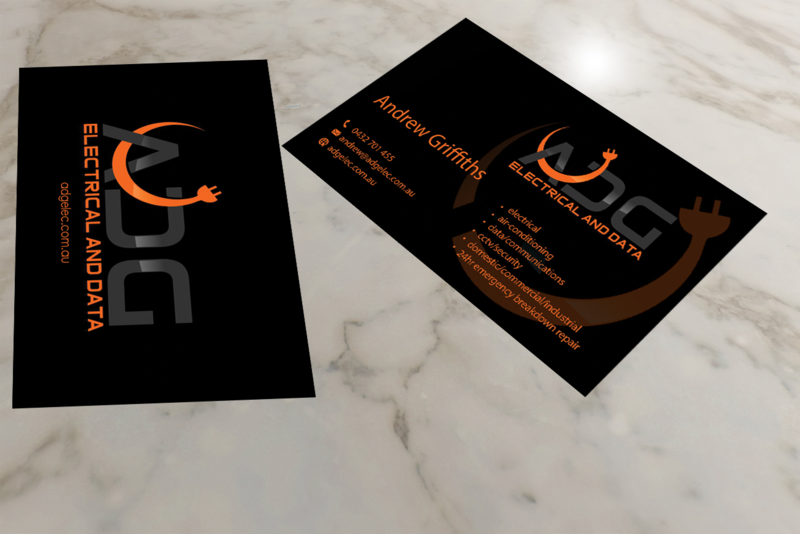 Make the right impression on potential clients with a professional business card design that will encourage them to give you a call. 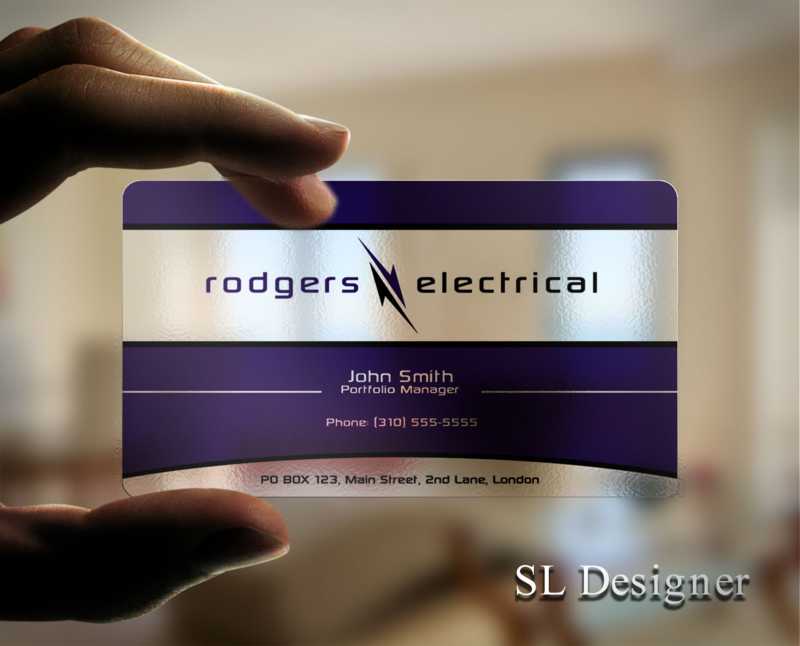 Want to add to our growing list of impressive electrician business cards? Share them with us in the comments.